Union Lodge in Dorchester holds a Paul Revere charter. Prior to meeting in Norwood the lodge met in Mattapan and previously Uphams Corner with other S Boston lodges. R. W. James Davenport, M.
W. Edward W. Baxter, S. W.
W. Samuel B. Lyon, J. W.
W. Master, Brethren and Ladies: I have been designated as the Historian of this occasion. I had no claim to this position, unless it was that I had been a member of the Committee, whereof Worshipful Brother Upham was the Chairman, which prepared the Historical Sketch of Union Lodge for the first eighty years of its existence, and as the writer of a meagre supplement to this sketch, read in the Lodge at its Ninetieth Anniversary. Though hardly entitled to the dignified appellation applied to me by the Committee of Arrangements, I have examined the well-kept Eecords of the Lodge, to obtain the material to enable me to discharge the duty assigned to me. History is a record of past events; but it is composed largely of the details of wars, the descriptions of battles, and the struggles of the people for greater political liberty, or against the oppression of tyrannical rulers. In the history of Union Lodge there is nothing analogous to the records of the nations, but all has been peaceful and harmonious, as it should be in a society of Brethren. Not that the members have always been of the same opinion, even in relation to purely Masonic subjects; but they have always settled their differences in a fraternal spirit. The record, therefore, affords a historian but meagre material for his office. During the entire century, rounded up and completed at this time, the chronicles of the Lodge contain little more than the names and the advancement of the candidates for admission to the Fraternity, though the Records are not wanting in the details of important events in the history of the Lodge. The time allotted to this epitome of our history permits of only a brief allusion to some of those events. Except during the period from 1826 to 1846, Union Lodge has enjoyed uninterrupted prosperity; and this is especially true of the last twenty years of its existence. In the space of one hundred years, immense changes, have .been wrought in the appearance and conduct of the Lodge. The present attentive and careful Secretary of the Lodge has indicated in pencil at the close of the third volume •of the Records the ten locations of the Lodge during the century of its existence. The first meeting of the Brethren was held at the house of Brother Samuel Richards, which afterwards became their permanent home for thirty-five years, the apartment in . which the meetings were held being called Union Hall. The second regular meeting was in Captain Pearson Eaton's Hall, where the first work of the Lodge was done, and where it continued to meet till November of the initial year. The building in which these early proceedings occurred is not now in existence, having been removed to make place for Eaton Square, at the junction of Adams and Bowdoin streets, Meeting-House Hill. Some of the present members of the Lodge can remember this house, with the grocery on the ground flooi', and it would not require a very vigorous stretch of the imagination to replace it. While the imagination is working upon the exterior of the structure, endeavoring to fill up the details of the surrounding scene, it will prove a very difficult task to most of the members of the Lodge of the present day* for the First Church, Lyceum Hall, the Mather Schoolhouse, the.steam fire-engine house, the Soldiers' Monument, and the green Square around it were not there, though at the Masonic meetings on the other side of the road were some who had fought in the battles of the American Revolution. Dorchester was then a farming town, and doubtless we might find many places at the present time which are counterparts of what Dorchester was a hundred years ago, especially if they have not been annexed to Boston, or some pther important city of the State. As we are all Ancient Free and Accepted Masons, we may permit the imagination to take a more daring flight while we present our visionary bodies before the Tyler of Union Lodge, one hundred years ago, craving admission as visitors, for, as we have not a single centenarian among our members to-day, our names were certainly not on the Lodge books of that time. If we had not been mindful of the incorporeality of our physical frames, we might well doubt the capacity of Captain Pearson Eaton's Hall to contain us all. If the first Secretary, Brother James Noyes, fully comprehends the situation, he will certainly wish that the three hundred visitors, more or less, came in corporeal form, for then he would have the pleasure of paying over to Brother Samuel Crehore, the treasurer, $112.50; for visitors in that day were required to pay a fee of two aud threepence, or thirty-seven and a half cents, for each person. Being of the consistence of Hamlet's ghost, we pass into the sanctum sanctorum without being punctured by the Tyler's sword, and salute the Right Worshipful Master, Ebenezer Withington, 3rd, for at that time there were so many Withingtons in Dorchester, that they had to be numbered as well as named. He is seated in the East of the Hall, on a level with the less important members, for it was not until ten years later that the Lodge voted to elevate the Master's chair three steps, the Senior Warden's two, and the Junior Warden's one step above the floor. In the West is seated the Worshipful Edmund Baker, Senior Warden; and in the South, the Worshipful James Davenport, Junior Warden. The Hall is lighted with tallow candles, making but a dim illumination, with a smoky air and an odor of heated grease. Most of the Brethren wear knee breeches, and their other clothing is very plain and simple, for dress had not become a fine art among common people a hundred years ago. The speech of the officers and members seems somewhat quaint and peculiar to the unaccustomed ears of the shadowy visitors, who revel in the contrast between the Masonry of 1896 and 1796. I have supposed that the Brethren of to-day, in their unsubstantial form, are present at the second regular Communication of the Lodge, in order to enable them to observe the work of that ancient period. In the course of time, the words a,nd the forms of the ceremonials became somewhat changed; but in recent years it lias been the object of the Grand Lecturers to restore the ancient ritual, which is believed to be substantially accomplished. Brother Benjamin Capen was the .first candidate, and as he had taken the first and second, a ballot was then necessary for .him to receive the third degree. Of course the shadowy spectators observe with the closest attention all the text and all the forms during the raising. If their immaterial condition had permitted them to do so, they would certify either verbally or in writing, that the work of to-day is practically identical with that of one hundred years ago. While the imaginative powers of this audience are still wrought up to their highest tension, I cannot resist the temptation- to exercise these powers in connection with a more recent occasion — the thirteen hundred and fifteenth Communication of Union Lodge, held May 12th, of the present year. Whether Worshipful Brother Dunham extended a special invitation to the first three officers of the Lodge in 1796 I am not informed, but I shall assume that the Right Worshipful Ebenezer Withington, "3rd, Master, Worshipful Edmund Baker, Senior Warden, and Worshipful James Davenport, Junior Warden, were present on that occasion. If it was necessary that the modern members of the Lodge should be incorporeal in order to visit the ancient Brethren, it is equally imperative that the delegation of their Masonic progenitors should come under the same conditions, since. they had been defunct fifty, sixty-four, and seventy-two years respectively; but whether by, the aid of some miracle of modern Spiritualism, Theosophy or other occult phenomenon, the ancient officials appear just as though they had not "shuffled off this mortal coil," and clothed in their usual Sunday garments. They wear the knee breeches, black stockings, shoe buckles, the long waistcoats and ample coats of their day and generation, and possibly some of the simpler moderns wonder if they did not come pn "wheels," and wear the bicycle costume of the present time. Our always polite and attentive Marshal Morey hastens to the door to receive the ancient visitors, and conducts them to the altar, where they salute the Chair in due form. They look about them, and.seem to be amazed, bewildered, confounded at the sight of the three hundred Brethren more or less, who fill the Hall to its utmost capacity, and at the elegant fixtures ; and furnishings of the apartment. They can hardly help contrasting the uncarpeted floor of Captain Pearson Eaton's Hall, with that upon which they stand; the kitchen chairs in which they sat, writh the carved and richly upholstered ones occupied by their successors ; the tallow dips, with the electric lights; the simple and modest costumes of those who filled the chairs one hundred years before, with the uniform and elegant clothing of the present officials, en grande tenue, as though they had just come from a ball or an evening party. The ancient Brethren cast their eyes around the walls of the spacious Hall, and dwell for a moment upon the portraits that adorn them. They recognize that of the Right Worshipful George Washington, for he had visited Dorchester in the discharge of his military duties; but His Royal Highness, the Prince of Wales, Grand Master of England, was not bom till forty-five years later; and Worshipful Brother Breck, so long our connecting link with the remote past,- came into the world two years after the date of our charter. The courteous Marshal presents the ancient Brethren to the Worshipful Master, who may have some difficulty in recollecting this incident of the occasion, and to the Worshipful Grand Lecturer, happily present at this meeting, to the dozen or more of Past Masters who fill the East, and to the Senior and Junior Wardens of the Lodge. The ancient visitors witness the working of the third degree conferred by Worshipful Master Dunham, assisted by the visiting Present or Past Masters. Worshipful Brother Withington, as may be remembered by the modern officials who have not forgotten it, declines to take part in the ceremonial, possibly because he does not care to have his work compared to that of modern officers, or perhaps because he fears he has become somewhat "rusty" after the lapse of a century; but he declares with no little emphasis that the work is identical with that of the ancient Brethren. At their own desire, and by the courtesy of our worthy Secretary, the visitors of a century ago examine the Records of the Lodge, as written by twenty-two different Secretaries. The trio are intensely interested in this inspection, for it is filling up the, gap of a century. Brother Ruggles resigns his desk and chair to the ancient head of the Lodge, and his fellow-officials look over his shoulder ou each side of him. At the same time, they devote a portion of their attention to the proceedings of the Lodge until a late hour. Then the Right Worshipful Brother WithingtiSn begs permission to say a few words to the modern Brethren, of which the Secretary makes a note, and I am thus enabled to report the substance of his remarks. "Right Worshipful Master," he begins, using the ancient form and dialect, though I shall not attempt to render the latter, "it affords me unspeakable pleasure to be able, through the materializing forces of modern occult science, to address you in relation to the beloved Institution in which this vast assemblage are so deeply interested. "I have looked with amazement upon the wonderful changes which have taken place in the town, now, I am told, a part of a city of nearly half a million inhabitants, as we wandered over its ancient precincts. We rode in electric cars, which seemed to us to be diabolical devices of Satan, moving at great speed without horses, and I wonder that we were not awakened from 'our long' sleep as these strange machines passed the North Burying Ground, where with fear and trembling we got into one of them. As we were whirled along at a dizzy speed, we saw many things that not only astonished, but. frightened us. What they .called a train of cars, with a hissing and smoking machine at the head of it, whizzed across the bay on a bridge, like a flash of lightning. We looked anxiously behind it to see if the Evil One was not chasing it. If he was, we did not see him. A man drew a match across a. stone, and produced fire, with which he lighted his pipe. We concluded that he had some mysterious connection with the place we read of, where milk would sour if it were kept there, for we smelt brimstone as he rubbed the match. We could not understand how the news from all parts of America, and even England, as well as the remotest parts of the earth, was obtained in a few minutes or hours; and we feared that Satan, had possession of the whole world and all. that therein is.. We wished to visit the North Meeting House, loved and revered for its associations. We went; to what was called Meeting-House Hill; but the House was no longer there; A stranger told us the old Meeting House had stood in front of some blackened ruins of its successor, built in 1816. He pointed out a large tree near the Soldiers' Monument, and added that .the pulpit of the-1 old church had been directly over the-trunk of that tree. We desired to visit, the Hall where the first work of the Lodge had been done; but the, building was no longer there. A green square, with a fountain in the middle of it, occupied the site of the house, and was called 'Eaton Square,' commemorating the memory of the Captain. "But, Right Worshipful Master, I am taking up too much of the time of the Lodge, though I must beg your indulgence while I make a few comments upon the revelations — for such they are to us — of the Records we have examined with so much interest. The books have been exceedingly well kept, especially during the last twenty years. The traditions of your elders appear to have been -carefully preserved and transmitted. While some of the manners and customs of a hundred years ago have passed away, those most vitally Masonic have been retained. I observe that the respect for the dead and the reverent commemoration of their memories have been a modern as well as an ancient feature of Union Lodge. I notice that the ' Sacred Scroll,' if not borne to the burying .ground, continues- to have a page in the books set apart for its record. Some of those thus Masonically embalmed were our friends and Brothers in the. Lodge, and it was with a thrill of my reembodied heart, that I read the sacred record of the departure of Worshipful Brothers John Mears and Jonathan Bridgham, and several others; and I would gladly allude to some of them if time permitted. "Of the craze of anti-Masonry, which for twenty years iswept over the country, we know but little, though I remember the beginning of it, and Right Worshipful Brother Baker passed through the whole of it,- laboring diligently And faithfully to save the Lodge from dissolution till there seemed to be no hope for Masonry. From the Historical Sketch which your Secretary was kind enough to show me, prepared by a committee of which your present Chaplain was the Chairman, I have obtained an idea of the Period of Decline in Union Lodge;. and as the earliest representatives of this Body, we can join with you most heartily and most earnestly in honoring Worshipful Brother John. Mears, who is said . to , have done more than any other- member to save the Lodge and its venerated charter, as well as Worshipful Brother Bridgham, and others. Especially would I express. my tribute of gratitude to the Macedonians who had taken a contract to resuscitate Masonry in Dorchester. I did not recognize. Brother Breck's portrait as a man nearly a hundred years old, for when I took him by the hand as a visitor to our Lodge seventy years ago, he was a young man of twenty-eight. Most nobly did he and his associates from the 'Macedonia beyond Neponset. River' carry out that contract, and Masonry here entered" upon a more successful career than it had ever known before. "Charity is one of the corner-stones of Masonry, and I am rejoiced to see that the Lodge still retains its charity fund, with trustees in charge of it; and I perceive from the Records that the custom which prevailed in our day of "passing round the hat," when pecuniary assistance was needed for a 'poor and distressed worthy Brother, is continued in these modern times. I noticed that on one such occasion about one hundred dollars was the yield of the hat; for the modern Brethren can afford to be more liberal than those of the early clays of the Lodge. "Right Worshipful Master, though night and day are both the same to your three ancient visitors, I will not keep you here till the rising of the May sun, though I have many . things not inappropriate to this interesting occasion that I should be glad to say. "It is time for us to shuffle off these material bodies, and resume our psychical existence only. I congratulate you and our modern Brethren upon the remarkable progress of our Lodge during the last half century, and I trust that the historians of the century upon which the Lodge is now entering will not have occasion to record any ' Period of Decline.' When the Brethren not yet born are moved to celebrate the Two Hundredth Anniversary of Union Lodge in 1996, I hope that the progress of materialization, theosophy, or other phenomena of occult science will enable us to be present, and to meet on that occasion the present officers of the Lodge, their heads whitened by the blossoms and the snows of long years of useful and happy lives. Unless the coming years shall develop a patent for the increase of longevity, all of them now in the flesh, with possibly a rare exception, will have passed on to the 'undiscovered country, from whose bourn no traveller returns,' and if the future Secretaries are as faithful as those of the past have been, we shall read the sacred roll that records their decease. "During the period of decline, a few names of some of the most zealous of our departed Brothers were not thus honored at their decease. I hope to be pardoned for suggesting to Worshipful Brother Upham, the Chairman of the Historical Committee, that these omissions may be supplied on interleaved pages. "And now, Right Worshipful Master, I bid you and all Brethren an affectionate and fraternal adieu." The Worshipful Master calls up the Lodge, Marshal Morey conducts the ancient visitors to the rear of the altar, where they salute the chair in due form. All three of them look upwards, raising their right arms at the same time. Then, without any one being able to see or comprehend in what manner, they disappear. The occult forces which had rehabilitated them in the semblance of humanity appear to have been exhausted by limitation. Worshipful Master, I hope to be pardoned for indulging in fiction, perhaps from the force of habit, on such an important occasion as the present; but I have used it merely as a medium for contrasting the Lodge of to-day with that of a century ago. With a decent and proper regard for the limit of your patience, I have not been able to mention some of the events of recent years. Some of us remember with interest, and even with affection, Friendship Hall in " Cracker Hollow," which was occupied by Union Lodge at the time when it emerged from the deep gloom of the anti-Masonic dark ages, in 1846. Here the Lodge began its renewed growth, which in fifty years has culminated in making it one of the most prosperous in this jurisdiction. Within the next ten years the trio; of "Macedonians" filled official positions in the Lodge. All of them have passed on to the Silent Land. In recent years Worshipful Brother Breck was honored and revered as the patriarch of the Lodge. In 1855, in, the still struggling period, Worshipful Brother James H. Upham became a member, forty-one years ago; and now the mantle of Brother Breck, as the oldest member of the Lodge, has fallen gracefully upon him, and we trust he will wear it till the years of his well-spent life are •equal to those of his venerated predecessor. I remember my own first coming- into the Lodge in. 1860, when Worshipful Brother Upham sat in the East, Worshipful Brother William Sayward in the West, and Worshipful Brother Thomas Knapp in the South. Brothers Upham and Knapp are happily still with us; but Brother Sayward, one of the most devoted Masons,, and one of the most useful to this Lodge, has passed away. The removal of the Lodge from Friendship Hall to Field's Corner proved to be a fortunate event in its history, for it greatly promoted its prosperity. The recent removal to its present locality has produced the same effect, and in a much greater degree. Certainly the Lodge is in the best possible condition on this huudredth anniversary, thanks to the present and recent officers, who have been diligent, faithful and ' progressive in the discharge of their duties. It is not a daring flight of the imagination to look forward to the Two Hundredth Anniversary of Union Lodge; for Masonry in substantially its present form, and not combined with Operative Masonry, is said to have existed in Scotland over three hundred years. We may deal with the present if not with the future. Union Lodge now begins the second century of its life; and the same faith, the same devotion to the Institution, the same earnestness of puipose, and the same resoluteness of execution which have characterized the Brethren of the first century, will accomplish another century of successful and prosperous existence. By Brother Reverend Robert A. Storer. Exactly fifty years ago on a Saturday afternoon in June, the members of Union Lodge, accompanied by their ladies and invited guests, numbering in all about two hundred, sailed on one of the Nahant steamers to Bass Point. Although the day was not too pleasant, the trip was short. Being safely landed and finding the tables fitly spread, the good company went at once to the meal, and when all had made an end of feasting, the Worshipful Master called the company to order and introduced the historian of the Lodge, Past Master William T. Adams, more popularly known as "Oliver Optic," who addressed them. In the style of an imaginative writer of adventure stories, this good gentleman gave the gathering a fascinating picture of the founding of the Lodge one hundred years before. In vivid imagery he brought his listeners back through the century to the day when the first Dorchester Masons met in the home of one of their members. There they sat in their respective positions in the Lodge, clad in knee britches and modest regalia, where they raised their eager candidates by the light of tallow candles. One can well imagine now impressive was the asking for "more light" at that time. And now on this day, fifty years after the feast at Nahant, Union Lodge members are gathered together to celebrate history. We have dined together in the best Masonic fashion and we are now ready to hear what the appointed historian of this day has to say. It occurs to me, first of all, in my reading of the ancient records, that Masons in all ages have had a high regard for the kind of fellowship induced by food. We have thereby taken our cue from the experience of the first man of legendary history, whose feasting on an apple resulted in the first act of fraternization. This history of Union Lodge can be told from a culinary angle for it is true that the work of the Lodge has proceeded for the most part either from refreshment to labor or from labor to refreshment. It was called a feast celebrating our Patron Saint John at which, in 1797, our Lodge was formally consecrated. One year previous, an original petition signed by sixteen men of Dorchester was received by the Grand Lodge of Massachusetts and a Charter granted permitting Union Lodge to commence its work from the sixteenth of June, 1796. This Charter, signed by the Grand Master, Paul Revere, is our most valued possession. For the consecration observance, an ode was written by the minister of the First Church, Brother Thaddeus Mason Harris, who later became a member of Union Lodge and Chaplain, both of his own Lodge and of the Grand Lodge. The ceremonies included the installation of the first officers, and as the records tell us, after the work, the Brethren partook of an elegant dinner, for which a charge of two dollars was made. We may well consider this an extravagant sum considering the fact that the finest hotels in Boston at the time charged only twenty-five cents, at the most, for any meal of victuals. We have no doubt that the price included wines and other fluids, since in the first year there was made to the Lodge a gift of thirty wine glasses and thirteen tumblers. In later inventories we learn that the glassware was considerably reduced through breakage. We are apt to think of our early countrymen as sober and upright men, which of course they were, but history shows them to be not adverse to festivity and sociability. In 1815 it was voted that the Bible should be closed during refreshment. Possibly some of the members regarded it a sacrilege to indulge in spirits while the sacred Great Lights of the Lodge were visible. About seven years later, however, the Brothers voted to reverse the decision and so it reads: "In the future the Bible shall remain open during the time of refreshment, as was formerly the custom." We cannot think of these men as especially wicked in their fondness for liquid refreshment, for at the time the Second Church in Codman Square was founded in 1806, the bill of expenses included among other items, whiskey, Madeira wine and gin for the sexton. How much improved the Lodge and Church are in this day of abstinence, I will leave to your opinion. During the dark years of Freemasonry in Massachusetts, resulting from the Anti-Masonic feeling caused by the publication of a spurious book by a man named Morgan, collations were at first simplified and then finally dispensed with altogether. But later, in 1893, when Freemasonry was re-established and in Dorchester the number of candidates was increasing, Union Lodge held a housewarming in the new lodge-rooms in the Robinson Block in Fields Corner. Christened Freemason's Hall, it was the scene of many bountiful collations. It was in Freemason's Hall that the Lodge adopted a new plan for installation of officers which was made public so that ladies could attend. At the close of these exercises, the Brethren and their ladies adjourned to Lyceum Hall on Meeting House Hill, where an elegant repast was served, followed by entertainment with music and dancing. We read of other delicious foods found worthy of being recorded in the minutes, such as oyster stews and the famous doughnuts served at the Cracker Hollow Meeting Place. It gives us a good example and a sound sanction for the continuance of that part of Freemasonry which is included under the general heading of refreshment. As we know now that Masons have always had stout stomachs, so, too, have they had stout hearts. From the very beginning, the word "charity" had something more than a ritualistic meaning for them. It is worthy of note to recall that in the original Charter, the members were empowered to collect funds for the relief of poor and distressed Brethren, their widows and orphans. This part of their original purpose has not been neglected. The placing of the hat on the altar to receive voluntary contributions for a worthy Brother was an early practice. In those years, these collections realized from two dollars to forty, and in one instance a sum of seventy-five dollars was obtained for a Brother in distress. These are noble amounts when we consider that in those early years of the history of our Lodge not many men were of considerable means. We read that during the first century of Dorchester's history men were mostly farmers, fishermen, small tradesmen or mill workers. But they believed that they had an obligation to their own. During the year 1804, a severe hurricane visited the community and the Lodge was quick to take up a collection for members who suffered loss. On one occasion a worthy minister from Weymouth was mentioned by Chaplain Harris as being in distress, and although it was haying time and not many members were present, a sum of five dollars and thirty-two cents was collected for his relief. Not limited to the giving of funds, it is recorded that one needy Brother received a suit of clothes. Even while the Lodge was struggling along for existence when meetings were suspended, the charity work went on. At one time a lot was purchased in Cedar Grove Cemetery and presented to the widow of a departed Brother. Although Freemasonry has never pretended to be a formal religious system, and has never in any way competed with the Church, we can be sure that our early Brethren were fulfilling the requirements of real religion, for it is recorded in the first letter of James, from the good Book, that pure religion and un-defiled before God the Father, is this: "To visit the fatherless and widows in their affliction." This we can be sure is a practice which Union Lodge has not abandoned in any of its 150 years. At the first meeting of Union Lodge in Uphams Corner in 1892, it is significant to note that although the furnishings for the new quarters had cost the lodge a sum of nearly three thousand dollars, the men listened with a sympathetic ear to the plea for assistance of a widow of a former member and one hundred and one dollars was found in the hat that evening. At the very next meeting in that same year, it was decided that a permanent Charity Fund be established and it was voted that once during every communication, the Master shall have the ballot box placed on the altar to receive contributions for such a fund and that the Master and two members of the Lodge were to constitute a Board of Trustees to hold the same until the principal should amount to three thousand dollars, after which time, the income should be used for relief. Thus the Charity Fund of Union Lodge came into being. As further evidence that our stout hearts have not weakened, we have only to remind you of the blood donor group formed in recent years under the chairmanship of Chester Whittemore and the generous contributions to the Masonic Service Fund for the entertainment of our young men during the past World War. We are ever mindful of the words spoken during one of our important journeys — "but the greatest of these is charity." And finally, not the least important activity of Freemasonry, which stands out throughout all the years, is the benediction we have given to our departed Brothers. The holding of services in home, in Church and in funeral parlors has been a conspicuous part of our work. We would not wish to have a comrade leave us for a better world without saying farewell. For the great names of Union Lodge which are still remembered, and the men whose names have long since been forgotten, there is included in our records a sacred scroll for each. We cannot let this occasion go by without mentioning the name of one who, while he was with us, was always the first to propose the name of a departed Brother for inclusion in the records. Worshipful Edward J. Ripley, who was always a living example of what all good Masons would wish to be, has departed from us this month. His parting will add his own name to the list of Brothers, so many of whose names he proposed. We can truly say of him: "Well done, thou good and faithful servant." The history of Freemasonry as exemplified in the long history of our ancient and honorable institution shows us that our brotherhood is such that no time or distance can separate us from the love of our Brothers. It is a history of men who placed above all other values in hfe the building up of right relations among men. Thus with one hand resting on the Holy Bible and the square and compasses, we reveal and declare our love to the Master above and high regard for ourselves, and with the other hand gripped in the hand of our human Master, we declare our great love for one another. By Right Worshipful Arthur Somerville. It is fitting that organizations, as well as individuals, as they travel along the pathway that leads from the dim and mystical past to that bright and glorious future to which we all aspire, should pause for a moment as they pass the fast-recurring milestones and take a backward glance over the path already trod, view its sunny heights and study its shadows, perchance to learn from past experiences something that shall prove of inestimable value in meeting the problems that may confront them in the days to come. It is not our purpose at this time to enter too deeply into the history of Union Lodge during the first one hundred and thirty years of its existence. This was done with remarkable clearness under the direction of our Senior Past Master, Linwood F. Gifford, who in the winter of 1926 appointed a committee to republish our History. This was accomplished and was ready for distribution at the June communication in 1927. Copies of this publication are still available and it is strongly recommended that any of the Brethren who are not familiar with our past, procure and read this interesting History. Our Lodge was born at a favorable period in our country's history. Our Illustrious Brother George Washington was about to retire from his eight years' service as President of the new nation and John Adams had been chosen as his successor. The new government was running smoothly and the men who had given so much of themselves for the welfare of the nation were now able to turn their thoughts to other channels. Freemasonry had demonstrated its loyalty to the principles enunciated in the immortal Declaration of Independence and the members of the Order had sealed with their blood their belief in the principles for which the new nation stood. 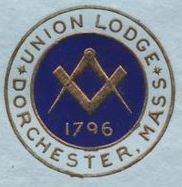 In 1796, sixteen Freemasons of Dorchester and vicinity petitioned the Grand Lodge of Massachusetts for the establishment of a Lodge of Freemasons in that Town. On the sixteenth of June, 1796, Union Lodge was empowered to work, being issued the priceless document now in the custody of the Worshipful Master of Union Lodge. To this Charter were affixed the signatures of Paul Revere, Grand Master; William Scollay, Deputy Grand Master; Isaiah Thomas, Senior Grand Warden; Joseph Laughton, Junior Grand Warden and the document was attested by Daniel Oliver, Grand Secretary. This same Charter has now passed through the hands of every Worshipful Master of Union Lodge and after one hundred and seventy-five years of service is still in a good state of preservation. To quote from the original historical sketch of Union Lodge, "It has passed through many vicissitudes, and has been in peril of surrender, loss and destruction: but it has been happily preserved from every mishap, and is now carefully guarded and affectionately cherished, not only as the proper authority for work of the Lodge, but as a valuable memento of the past." The origin of any organization of this kind is always a matter of particular interest. It is well to consider that the Lodge itself has been in existence almost as long as this government of ours; that its charter members were all living during the Revolutionary War and some of them fought in it; that the Grand Master of Masons in Massachusetts who signed its Charter in 1796 was Paul Revere, who was an enthusiastic Mason, an active participant in the activities of the Revolutionary War, and succeeded to the position of Grand Master in 1795, serving for three years. Dorchester, founded in 1630, was still a town on its own right and, like most of the original towns, the original area was great. At the time of its greatest extent, Dorchester stretched from City Point, South Boston, to within a few rods of the Rhode Island boundary line, a distance of thirty-six miles. As a group of settlers in an outlying district established their own church, it was natural that they should desire to manage their own town affairs as well and the General Court usually granted the request. Shortly after Union Lodge was organized, Dorchester was further reduced in size as Canton was named in 1797. Meanwhile, Boston was coveting Dorchester Neck (South Boston) which was geographically closer to that town than to Dorchester, and in 1804 a warning of Dorchester's ultimate fate was sounded when the annexation of the Neck to Boston was approved. In 1865 Washington Village (the Andrew Square section) was also lost by Dorchester to Boston. Meanwhile the people in the extreme southern part of the town as it then was, saw the writing on the wall and temporarily escaped annexation to Boston by organizing the separate town of Hyde Park in 1868. A year later, the people of Dorchester voted for annexation to Boston and on January 4, 1870 the political existence of the Town ended. Union Lodge was closely associated with the First Parish Church in Dorchester and its Minister, the Reverend Thaddeus Mason Harris, was the first Chaplain of the Lodge. Union Lodge laid the cornerstone of the present church building with appropriate ceremonies in 1896. As part of our 175th Anniversary observance, we are privileged to participate in a Divine Service on Sunday, June 13, 1971, in this grand old historic Church. From its inception Union Lodge enjoyed about thirty prosperous years when the wave of adversity which swept over Masonry throughout the country affected our local institution. The so-called anti-Masonic period engendered by the Morgan incident in New York made itself felt with devastating effect. Many Lodges succumbed, others went underground or suspended operations while their precious charters were safely guarded by loyal members. For a Mason to identify himself as such in public required great courage. Courage and stamina were not lacking in a few hearty members of Union Lodge and for a period of twenty years (1826-1846) meetings were held secretly. The Lodge can be said to have had nothing more than a bare existence. This anti-Masonic period slowly exhausted itself and people began to realize that a cruel injustice had been borne by the Fraternity. Former bitter hatred eventually changed to respect and high esteem and an era of Masonic prosperity began. As we look back on this period we are proud of the loyalty of these brethren who held our Charter and continued to submit reports to the Grand Lodge. The growth of Union Lodge was slow and it was approximately ten years after the revival of Masonry until the Lodge was in good working order. Progress continued through the years and reached its peak in membership just before the depression years of the 1930's. We can look back thankfully to the year 1881 when, by vote of the Lodge, a Permanent Fund was established. This fund has grown to considerable size and the interest of this fund is now assisting in the general expense of the Lodge. The Charity Fund was established in 1892 and like the Permanent Fund it has grown through the years. Records bear evidence of many instances of service and assistance rendered by the Lodge to brethren in need of help and of advice and assistance to a deceased member's family. Prior to the establishment of the Charity Fund it had been necessary to "pass the hat" at a meeting in order to contribute to the relief of a distressed worthy Brother. Since the History Book written in 1926, forty-five years have passed and many changes have taken place in the world; the depression of the 1930's, World War II and the Korean and Vietnam Wars. Our country has grown in population and prosperity; world boundaries have all but vanished with the advent of radio, electronic devices and space exploration. Science has advanced its frontiers far beyond the reach of our comprehension. The changing conditions in Dorchester have had their effects on our activities. Many members of Union Lodge have moved to other communities and, as might be expected of a Lodge reaching its 175th Anniversary, many of its members have reached life's peak. Almost every month our communication reports the passing to the Celestial Lodge above of one or more of our members, adding a touch of sadness to life's onward trek. In 1946 Union Lodge celebrated its 150th Anniversary with appropriate ceremonies. (1946 Mass. 178-186) The Most Worshipful Grand Master of Masons in Massachusetts and a distinguished Suite attended a Special Communication at Up-hams Corner. A dinner dance was held at the Hotel Statler and a Church Service was observed in the First Parish Church in Dorchester. One hundred Brethren have been honored by election to the office of Worshipful Master and they have responded zealously in service to the Lodge. There are thirty-one still living. Eleven of our Past Masters have been further honored by Grand Lodge appointment, serving as District Deputy Grand Masters. In all these one hundred seventy-five years, Union Lodge has played its honorable part in many events of local and national interest. We are proud of the Brethren who have been associated with Union Lodge in the days gone by, deeply grateful for our honorable past and recognize that we have a responsibility to carry on. In the tradition of what has been done, and under the guidance of the Grand Architect, may we go forward with renewed confidence and a firm determination to preserve and continue the high character of its achievements, increase the luster of its reputation and live nearer to the ideals for which the Fraternity stands. May Union Lodge-continue to be a creditable monument to its founders as we look forward into the future with faith and confidence in the Brethren who are to bear the burdens in the days to come. Officers in Union Lodge, Dorchester. R. W. Cyrus Balkcom, M.
W. Isaac Washington, S. W.
W. William Hendley, J. W.
The meeting of Union Lodge. Dorchester, Tuesday April 13, was one of the notable events in her history and will be long remembered by the brethren present. Masonic Hall was thronged with members and visitors. The principal guests were Most Worshipful Dana J. Flanders, Grand Master; Right Worshipful Past Grand Masters Edwin B. Holmes and J. Albert Blake; Right Worshipful W. H. L. Odell, past Deputy Grand Master; Right Worshipful Melvin M. Johnson, Senior grand warden; Right Worshipful Past Grand Wardens James M. Gleason. Wm. H. H. Soule, Charles S. Robertson, John A. McKim, William M. Belcher' Grand Treasiirer Charles H. Ramsay; Grand Secretary Thomas W. Davis and others. The visitors were introduced by Right Worshipful W. F. Schallenbach, District Deputy Grand Master. Worshipful Master Walter R. Pond received his guests cordially, saying to the Grand Master "that it was with unbounded pleasure" that he greeted him in Union Lodge. Grand Master Flanders responded gracefully to his welcome and thanked the Worshipful Master for the cordiality of his words. An invitation to Past Grand Master Holmes to assist in the ceremony of exemplification was prefaced by a remark from the Master that eight years ago the noted guest had conferred the Worshipful Master's degree upon him. The important event of the evening was the presentation to the Grand Master, by Worshipful Master Pond, in behalf of Union Lodge, checks to the amount of $465. for the new Masonic home. Of this amount $250 was raised by a minstrel show given by the members of the Sodality Club, a club composed of members of Union Lodge, and $215 represented subscriptions of individual members, making a grand total of contribution from the lodge up to the present time of $1,200. The Grand Master expressed the heartiest satisfaction in accepting this generous contribution, saying while he knew of the interest the lodge was taking in the home this action was a surprise. The Grand Master spoke cheerfully of the progress being made in the work for the home, giving credit to Past Grand Master Blake for the important part he had taken in the great enterprise. Remarks were made by Past Grand Master Blake and Past Grand Master Holmes and Grand Warden Melvin M. Tohnson. Union Lodge, Dorchester, Mass., had a notable meeting, Wednesday, March 8th. Among the prominent Masons present were: Grand Master Dana J. Flanders, and Past Grand Master Charles T. Gallagher. The special interest of the occasion was in the fact that there was a deputation from Thompson's Island Farm and Trades School to witness the admission of some from their institution to the lodge. In a speech in response to an invitation to address the lodge from Worshipful Master Frank M. Weymouth Past Grand Master Gallagher declared that it was great satisfaction for him to be present for in Union Lodge his father became a Mason and that induced him to follow the example. It was a still greater pleasure for hint to assist in the exercises because four of the candidates were graduates of the farm and trades school of which he was a trustee, and also to know that 17 of its graduates were also present to see these young men start their Masonic life. He could simply say that after the training they had received at the hands of Supt. Bradley they were eminently fitted to battle with the world and to become deserving citizens. In the course of a happy address Worshipful Master Weymouth presented the Grand Master a check for $100 toward the Masonic home and said that it brought the amount contributed by it to $1700. The announcement was greeted with applause. Grand Master Flanders thanked the lodge for its generosity, and in referring to the home hoped that it would he opened in the near future. Funds were coming in rapidly and the prospects were never better. Union Lodge of Dorchester, Mass., celebrated its 115th anniversary, Saturday, June 10, by showing marked attention to its veteran members, who have been connected with the lodge for a quarter of a century or more. The Past Masters who have gone along the path of years since attaining their honors contributed largely in carrying out the idea of the celebration by assuming the offices during the exemplification. Some of them, indeed, came within the charmed circle of those constituting the patriarchs, and it is remarkable that all of the surviving Past Masters were present. Elisha Moseley was the dean of the nearly three-score in the list, having signed the bylaws of the lodge in 1858. There was a tremendous ovation as he responded to his name, and it was the same when the Tyler, Benjamin C. Bird, is years in harness and the second oldest, was called. There is no survivor in the five years between the two. Not one of those who became members from 1872 to 1876 has lived to see what was arranged as the observance of the 115th anniversary. At 3.30 a committee escorted the Past Masters to the lodge room where Frank M. Weymouth, W. M., received them. To Isaac H Eddy, J. Lodge Eddy and James T, Sherman he presented Past Master's aprons. The regular officers vacated their stations which were assumed by the Past Masters. Class of 1858 — Elisha Moseley. Class of 1863 — Benjamin C Bird. Class of 1864 — Laban Pratt and John U Porter 2d. Class of 1865 — Henry Hall, John E. Swan, John L. Bird, Charles A. Burditt and Ansel F. Temple. Class of 1866 — Sargent Fruear. Class of 1867 — Edward Stern and William H. Chase. Class of 1868 — George A. Jones and Walter F. Cook. Class of 1869 — Stephen A. Wiswell and Fred A. Brigham. Class of 1870 — Rustes Gordon, Cyrus C. Conant, Frederick L. Pierce, Joseph T. Ward Jr., George H. Parker, Isaac H. Eddy, Alexander Pope Jr., and William Carroll Pope. Class of 1871 — William C. Wellington and Frederick B. Pierce. Class of 1872 — Franklin J. Clerk and John A. Burgess. Class of 1876 — Horace T. Clay. Class of 1877 — John Mears. Class of 1878 — William F. Temple. Class of 1879 — Frederick H. Bronsdon and Ira E. Fairbanks. Class of 1880 — J. Lodge Eddy, Gilbert A. Daggett and Thomas J. Hatch. Class of 1881 — J. William Tolman, George J. Parker, Herbert Gough and James T. Sherman. Class of 1882 — Levy Herman, George H Rimbach, Frank W. Whitcher, Richard H. Jenness, George L. Smith and Walter E. Paine. Class of 1883 — Solomon M. Hyams, Frank E. Trask, Sewell A. Faunce and George W. Burditt. Class of 1884 — Godfrey M. Hyams, Frederick L. Walker, Sumner B. Cole, George Eddy and William H. Dolbeare. Class of 1885 — Clarence B. Mitchell and Caleb D. Dunham. Class of 1886 — Alexander H. Copley. At the banquet there were more than 250 Iprcscnt. Worshipful Master Weymouth, who presided, spoke of the events of the day, how much they meant to the lodge and complimented the Past Masters as well as the veterans. It is evident, he said, that Freemasonry is a permanent institution in Dorchester. They could, he was sure. 1ook forward with confidence to the future. Sec. Rand read from the records of a century ago and they enlightened the company about the way affairs were conducted in 1811. The Master presented letters from Ansel F. Temple and Horace W. Clay, who were unable to join in the festivities; there was an anniversary ode written by W. T. H. Salter and sung by a quartet, oration by the chaplain, Rev. Clifton D. Cray, followed by addresses from Past Grand Warden Soule, Past Masters Abbott and Knight, song from Arthur K. Rogerson, with Auld Lang Syne to close. Orchestral selections and numbers by the quartet were provided at intervals. We append the ode written by Brother W. T. Salter for the occasion. How swift the sands in the hour glass flow! Their altar was God's footstool up above. The plumb, the level, trowel and the spade. They found rude and to perfection brought. Cemented all by fond affection's arts. And spread nur table with corn, oil and wine. They sought their couch prepared by Mother Earth. Ye living stones today assembled here. Shall bring the Jewel of God's grand "Well done." How quick the sands in the hour glass flow. Union Lodge, A. F. & A. M., of Dorchester, Mass., celebrated its 125th anniversary Sunday morning, May 22, will services at the First Parish Church (Unitarian). The church was filled by 600 members of the lodge, their friends, and delegations from Dorchester Royal Arch Chap ter, St. Omer Commandery, Rabboni and Algonquin Lodges. The sermon was delivered by the Rev. Bro. Adelbert L. Hudson, on the subject "What the World Owes to Freemasonry." Dr. George M. Hersey, worshipful master of Union Lodge, was in charge of the exercises. A special musical program wa given under Malcolm Lang, organist-director. Ebenezer Withington was the first Master of the lodge, and its charter was signed by Paul Revere, when he was Grand Master of the state. This page was last modified on 21 October 2018, at 20:12.